Former Manchester United defender Gary Neville thinks Jose Mourinho should instruct his side to take full advantage of set-pieces during United’s match against Liverpool on Monday. Manchester United travel to Anfield next Monday in what could possibly be their most crucial match of the season. The Red Devils are hoping to improve their form, after seeing out a 1-1 draw against Stoke City last time out. Jose Mourinho will also look at this match as a possible turnaround this season, after already failing to beat their neighbours Manchester City last month. United fans around the globe will be watching with hope in their hearts and anticipating their side to earn them bragging rights. 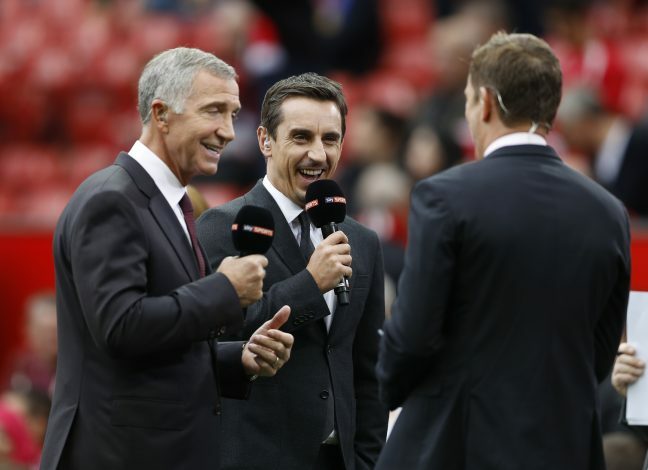 Gary Neville, a member of Manchester United’s famous Class of 92’, believes that Jose Mourinho could just be able to edge out Liverpool. The former Valencia managers say that United’s players should concentrate on set-pieces, as he thinks this will enable United to exploit Liverpool’s weaknesses. He told Sky Sports: “The big weakness for Liverpool on Monday is set pieces. If United put the ball in the box around the goalkeeper and the back four there’s going to be problems. That’s the way Liverpool are at the moment. “I did think that the last 15 minutes against Chelsea was a big, big moment. To come through it when it was 2-1 was a big moment to give them the confidence that they can actually hold on to a lead. So, Jose Mourinho, take note.